When your home is clean and tidy you find that life runs a lot more smoothly and it’s just the same with your business. Spring is often the time of year when you are full of new ideas and plans for the future and it makes sense to spend some time reviewing your workload, dusting off your admin and applying your housekeeping skills to your filing, website and social media! You can’t cook efficiently in a cluttered kitchen and you can’t work in an untidy workspace. There’s nothing worse than having to sift through piles of paperwork to find that one important document that you need, and losing important customer details could be disastrous. I know you want to cook up a successful business so start off by making sure that your workspace is clean, tidy and organised – whether you have an office, a room at home or just a desk, take a look at your work area and make sure that it works for you. Maybe you need an in and out tray or perhaps you’re going to be brave and go totally paperless! Is everything you need in easy reach and do you know where the files you need most often are? You could also make sure that your surroundings are calm and inspiring. Perhaps you could refresh your office with a re-paint or put up some vision boards to keep you focused on where you want to take your business in the future. An organised workspace is a great start to running an efficient and effective business. Are you one for keeping things ‘just in case’, or saving things for later that you never really get round to using? Maybe you put something somewhere intending to find a permanent home for it, and it doesn’t get moved again leaving it looking out of place and taking up unnecessary space. This often applies to our filing on our computers, saving documents or images in the main folder because you’re not sure where it should go, and you intend to set up some appropriate folders later and move them. If you don’t follow that through, when you next need it you have to hunt through various folders and filenames looking for the right one (or using the handy search bar). Take some time to create a sensible set of folders to save everything into, and delete anything you really don’t need, resulting in a neater filing system visually and it being easier to find what you need. The same applies to the favourites list in your internet browser, we so often ‘favourite’ something so we can easily go back to it, but have to scroll up and down searching for the one we want because there’s so many in there! Take a look and delete the ones that are no longer relevant, and create some folders to neatly organise links to similar websites, such as having folders for your social media pages, blogs you regularly read, articles with business advice and tips. Something else that creates unnecessary clutter are all those email newsletters that arrive in your inbox and never get read. Be ruthless and unsubscribe from the ones you never open or are irrelevant to your business or circumstances. For the ones you do read or intend to read sometime soon, create a folder in your inbox (mine’s called Breaktime Reading) and either file the emails in there when they arrive, or set up a rule to automatically file them into that folder. Then you can access them and read at your leisure without them clogging up your inbox. I read mine on my tea breaks, hence the name of the folder! During a tidy up we often find tins and packets that nobody uses and that are well past their sell by date. Sometimes when you run a business you can find that you have products or services like that too. It’s important to look at your sales and find out which ones are working for you and which ones are holding you back. Perhaps you offer a product that you don’t make much profit on or a service that people don’t want to pay enough for. You might even offer a service to clients that you don’t really enjoy doing which it taking time away from the elements of your work that you really enjoy. This is the ideal time to streamline your business offering and make sure all of your services are profitable, customer friendly and enjoyable for you. When we do a spring clean it gives us a chance to look at how the home runs and we can often spot synergies that will make our lives easier or opportunities to do things better. We realise that moving the sofa gives the kids more space to play or that an extra cupboard would really help with storage. It can be the same with your business. Take the time to consider how everything runs at in your business and if there are any changes that you could make. Sometimes just a small change such as hiring someone to help you with your admin or implementing a new filing system for your emails can make a big difference to the way that you manage your business. Processes can sometimes be streamlined to save wasting unnecessary time and effort, if you can’t see it yourself, perhaps someone outside of your business can identify these for you. If the washing machine’s on the blink or the kettle takes ages to boil then it’s got to go or be fixed! It’s the same when you take a look at your business – if something isn’t working for you then now is the time to get rid of it or to make the changes that are needed in order to get it working again. Take a look at your website – is it up to date and is it getting you the conversions you need? Review your social media – are you engaging with your ideal customers enough and putting out relevant content? The business world moves fast and it’s vital to make sure that what worked for you a year ago is still working for you today. Ask yourself if it can be fixed or if it needs to go completely. Getting rid of the elements of your business that are no longer working for you gives you room and time to implement new processes that will help and support you. Sometimes items around the house might look at bit dull and dusty but all they need is a good polish and they look wonderful again – and it’s the same with our business skills! As a final part of your spring clean take a look at what you need to learn or improve to take your business to the next level. You might want to learn book-keeping skills to make sure you understand your finances better or it could be that you feel you could benefit from the confidence that a style workshop can bring. Perhaps you have realised from one of the previous tasks that you need to learn more about a social media channel that you don’t currently use, or you might have recognised that you need to improve your time management or productivity. Don’t be afraid to take on learning something new, as polishing your skills will always be a benefit to your business. 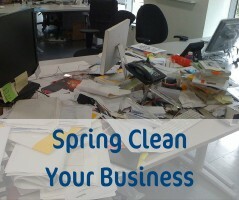 So now you’ve done your spring clean and you can look around and take pride in your bright, shiny and effective business. You’ll have an organised workspace, you’ll know what works and what doesn’t, you might have some new skills and you would have cleared away anything that wasn’t working for you. So, it’s time for a rest, a cuppa and a slice of cake! Now you have a brilliant basis for planning the successful future of your business. These jobs are ideal to do in your quiet periods, or even when you have the children at home for school holidays, as you can still feel productive and get stuff done without feeling like you are working so much. If you get stuck on any of it and think a fresh pair of eyes would help, just one session could give you the support you need. Get in touch to find out how. Just don’t ask me to help with the actual spring cleaning! Follow us on Facebook for more tips, advice and support for women in business.